Perhaps no venue in Barcelona is as famous as Camp Nou, the home stadium of FC Barcelona and the Catalonian National Team. FC Barcelona, widely considered one of the best football teams in the world, popularized this venue as their home pitch and this stadium and team in turn helped to brand the iconic image of the city of Barcelona. With a seating capacity of 99,354 people, Camp Nou is the largest stadium in Europe. It was built in 1954 under the name Estadi del FC Barcelona by a group of architects, including Phillip Francesc Mitjans, Josep Sotera, Lorenzo García-Barbón Joaquin, Philipe Pedro Agnew. Further construction developments occurred in 1980, before the 1982 FIFA World Cup which was held in Spain. New VIP boxes were added and seating capacity was altered once again for the 1999 UEFA Champions League final match. No further changes in construction have taken place, although the official name of the club was changed to Camp Nou in 2000 following a public poll. Though the stadium is most famous for its team and the games it has witnessed, Camp Nou has also been the venue of many a concert and public celebration. Pope John Paul II held mass at Camp Nou on November 17, 1982, to celebrate his honorary citizenship in Catalonia. In 1983, Julio Iglesias held a still memorable concert for 60,000 and U2 launched their 360° tour (pictured below) at the stadium. And on August 8, 1988, Michael Jackson held a concert for 95,000 people as part of his Bad World Tour. The concerts that have taken place at Camp Nou give a fair assessment of the stadium’s size. The artists that have played at the stadium had huge international fan bases that validate the use of such a large stadium. 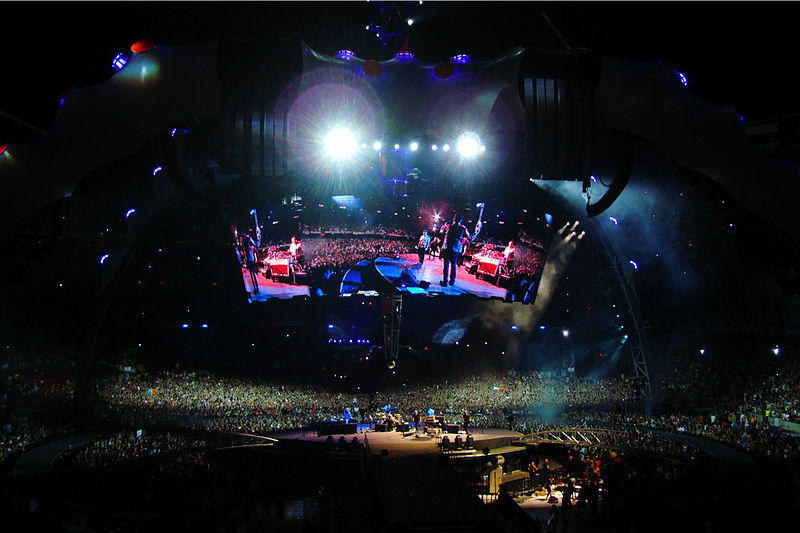 It is important that during the concert that the size of the stadium does not give the impression of an empty audience. Therefore, only internationally successful groups have been known to play at the Camp. Future plans for Camp Nou include a remodel that will increase seating capacity by 13,500, making it the third largest stadium in the world. British architect Norman Foster and his team have been selected for the project. The construction had an original deadline of 2012, but plans have been put on hold due to the current economic crisis in Spain. You are currently reading Camp Nou at Barcelona Music Tour.